Are you on Team Love ‘Em or Team Hate ‘Em when it comes to leftovers? When it’s just the same thing reheated the next day, we’ll pass but then there are holidays like Thanksgiving and Easter when leftovers can magically transform into something else. Dare we say, often something better than the original? If you’re making hot cross buns for Easter, you’ll likely have leftovers. After seeing this recipe a few weeks ago, we were inspired to bigger, badder, and better things. Imagine this as the beautiful mess that’s made on a breakfast plate at a diner. The maple syrup from your French toast slides over to meet the sausage. You take a fork of egg with sausage and perhaps skewer a piece of toast as well. On their own, they’re good. Together, they’re great. You’ll of course be turning leftover ham into sandwiches, but don’t forget about the buns. First, we made a batch of traditional hot cross buns using this recipe from Foodness Gracious. They’re fluffy yet rich, spiced and sweet, and studded with plenty of golden raisins that caramelize when they poke through the outside of the dough. And what would a HCB be without the cross? Before baking, pipe on a mixture of flour and water, which sinks into the dough as it bakes. Have a few of these leftover that have gotten a little stale? Over here, stale bread means one of two things – breadcrumbs or…french toast! Split the buns in half, soak them in a simple French toast batter (with no added sugar or spices since the buns have plenty of that), then pan-fry in butter until nice and toasty. To make this extra one-pot friendly, fry the sausage in the pan, then the hot cross buns, then the eggs. Layer it all together with cheese, drizzle it with maple syrup, and you’ve got a Easter leftover mashup that might require a prescription of Lipitor. 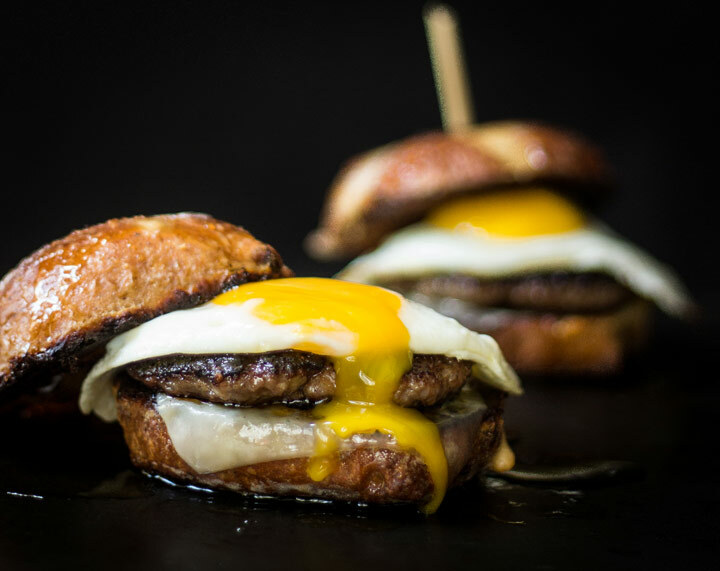 It’s somewhere in between a burger and a breakfast sandwich with a splash of french toast and croque madame thrown in there for good measure. It’s not healthy. It’s not gluten free. It’s not vegan, vegetarian, paleo, dairy free, or raw. But it’s good. It’s really. really. good. In a shallow pan, whisk together the 2 eggs and 1/3 cup of milk for the French Toast batter. If you are making more, simply double or triple the quantities. 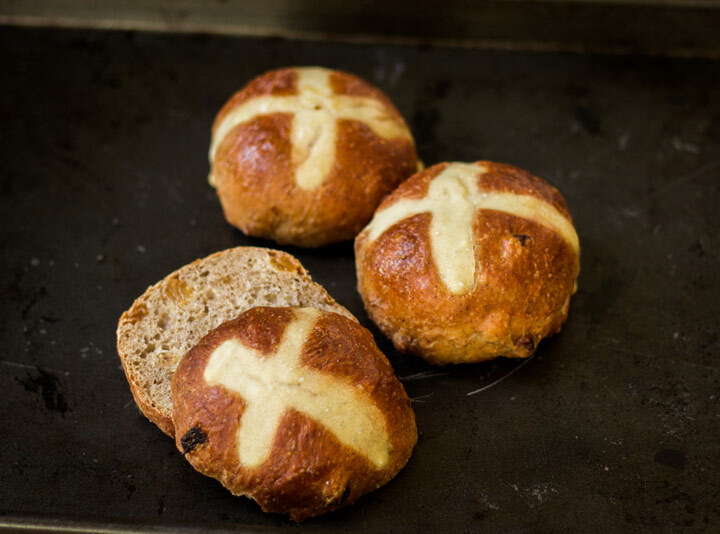 Split the hot cross buns in half and soak in the egg mixture on both sides for several minutes. Heat a heavy bottomed skillet (like a cast iron pan) over medium heat then add a tablespoon or two of vegetable oil. 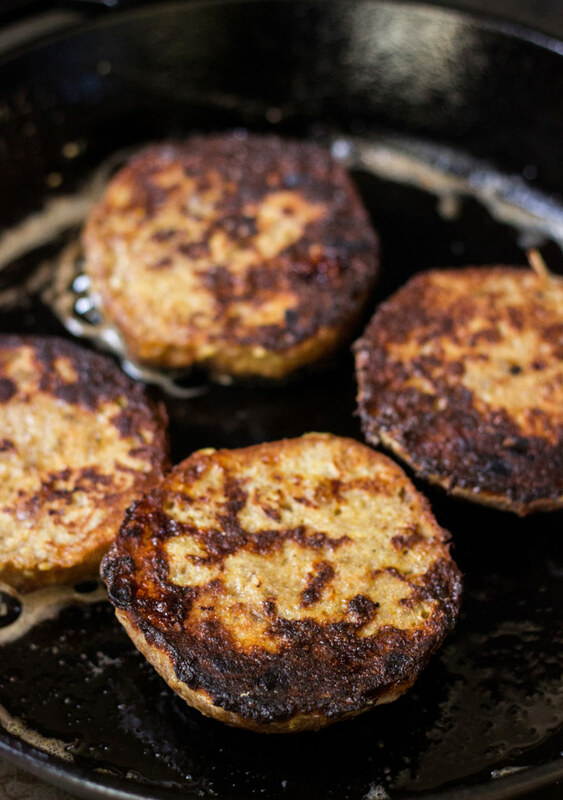 Add the breakfast sausage patties and cook on either side until cooked-through. Set aside on a paper towel-lined plate to drain. In the same pan, add a tablespoon of butter and swirl to coat. Add the soaked hot cross buns and pan-fry on either side for 3-4 minutes until golden brown. Do this in batches if needed, adding more butter as required. Set aside and the base of each sandwich with a slice of cheese. In the same pan, add another tablespoon of butter and fry 1 egg per sandwich to your liking (we like sunny side up but scrambled or over easy would be great too). To assemble, place one piece of sausage on top of each hot cross bun base, top with a fried egg and drizzle with maple syrup. Place the top half on top, drizzle with more maple syrup and serve.